With more and more librarians scaling back on encyclopedias and thinking twice before investing in expensive multivolume sets, selecting the right database has become more vital than ever. Though there’s a plethora of options that have become available over the past year, the best selections go beyond providing students with raw information, featuring interactive elements and activities. The importance of STEM is reflected here, but, even more significantly, these innovative offerings give students a chance to see science come to life. The results are in: a roster of dynamic and on-point databases that will more than meet 21st-century student needs. K Up–If a picture is worth 1,000 words, then this database is a veritable treasure trove of information. 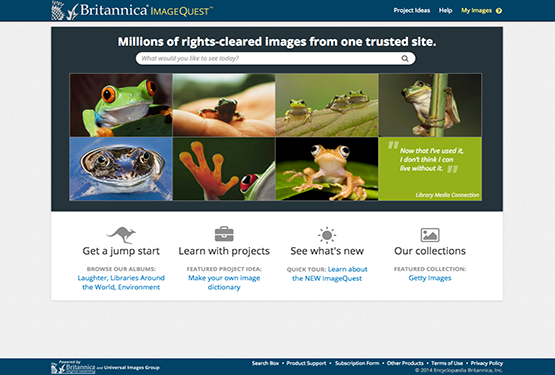 This latest update of Image Quest (first released in 2010) includes two million additional images, up from one million. Ease and simplicity are the hallmarks of this compilation, which allows users to search for images on their own or to choose from well-curated albums. Students and educators are free to use the pictures in reports or school websites or newsletters, and all are accompanied by metadata (including captions, source, and copyright holder). Users seeking specific subjects will easily find what they need, but there’s plenty of opportunity for discovery here, too, and along with the tried and true, students may even find some pleasant surprises as they browse. No library should be without this database, which caters to an incredibly wide array of users. Mahnaz Dar is associate editor, SLJ book review. This article was published in School Library Journal‘s February 2015 issue.